With its slim stature, impeccable sound, and an air of modern sleekness, the KEF R500 is perfectly suited for any interior space. The R500 floorstanding speaker uses our point-source Uni-Q driver array to fluently produce both high- and mid-frequencies, as well as two 5.25 inch aluminum low-frequency drivers to give your listening experience that extra rumble. What you'll get from this driver combination is an accurate, spacious sound image that approaches the benchmark standards of our legendary REFERENCE Series. The R500 features a 5 inch Uni-Q driver array with a 1 inch aluminum dome tweeter at its acoustic center. This Uni-Q driver array offers an especially articulated high-end response, thanks to a large neodymium magnet and a computer-optimized dome structure so stiff that it operates pistonically over its entire working range. On top of all that, our 'tangerine' waveguide ensures a wide and even dispersion without interference between the high-frequency and mid-frequency drivers. 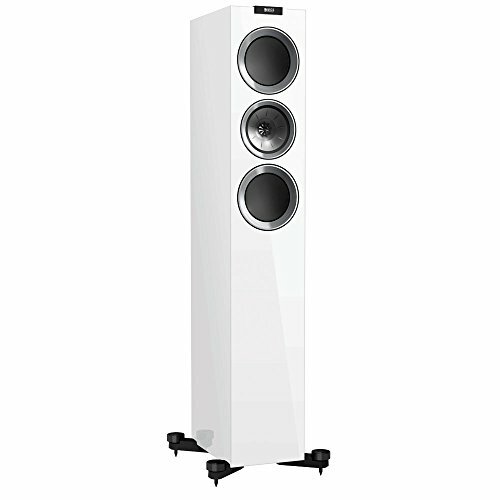 The R500 floorstanding speaker also features two 5.25 inch low-frequency drivers both above and below the Uni-Q array, which feature massive vented magnet assemblies and large, lightweight aluminum voice coils driving an inner hybrid cone each. This setup ensures a clean, deep and uncompressed bass output with superb dynamics. The R500 features a 5 inch Uni-Q driver array, which consists of both mid-and-high-frequency drivers. The purpose of the array is to have both frequencies coming from the same place, allowing them to integrate perfectly and create a convincingly natural sound. The R500 floorstanding speaker also features two 5.25 inch low-frequency drivers above and below the Uni-Q array, which ensures a clean, deep and uncompressed bass output with superb dynamics. The R500 sits on an aluminum plate supported by four steel "plinth" spikes with locking knobs for easy height adjustment. The plinths also serve to ground the R500, resulting in a rigid connection that eliminates any rocking resonances. Our 'tangerine' waveguide technology helps to disperse the higher frequencies produced by the R500 evenly across a wider angle to flood your listening room with an intricate and refreshingly natural soundfield. The R500 pairs perfectly with the rest of our R Series home theater speakers, from center channels to subwoofers, to create a three-dimensional soundstage that makes movies and television sound that much more believable.